Walter Melville Wills, the tobacco magnate, built Bracken Hill on the Somerset side of the Avon Gorge, near the Clifton Suspension Bridge, as his home in 1896 . His Estate Office was across the road at ‘Rayne Thatch’ – discussed in Chapter 31 – and he also had a hunting lodge at Abbots Pool, as discussed in Chapter 38. He employed James Pulham and Son to work in them all. The rock garden and water garden at Bracken Hill were constructed between 1923-25, but the work over the whole site was carried out in three or four stages between 1917 and 1930. There is a Pond and Gunnera area to the side of the house, and a path leads beneath two spectacular sandstone and Pulhamite arches and the ‘Acid Mound’, where the original alkaline soil was replaced with special ericaceous soil to encourage the growth of heathland plants. This leads on to the hardy bamboos that provide protection from the cold winter winds, and a rock garden that contains a selection of mountain plants that thrive in the gritty soil. 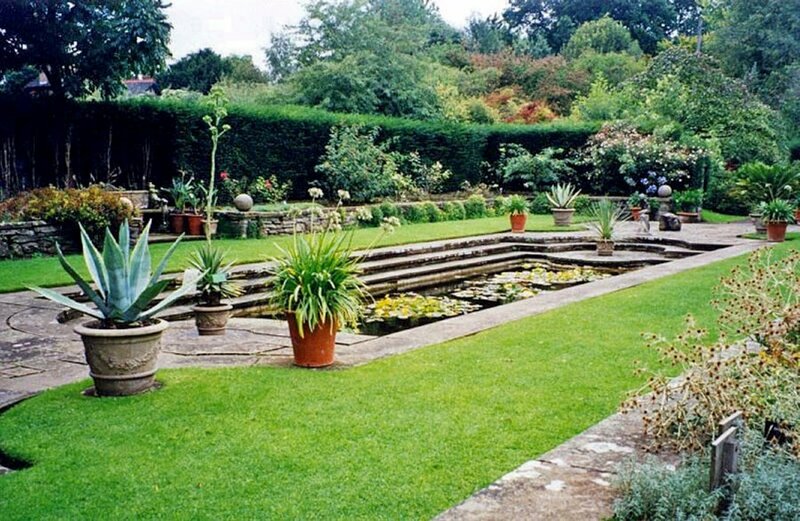 In the far corner of the property is the ‘Formal Lily Pool’, which probably dates from around 1919, because there is a picture of it in Pulham’s Garden Catalogue published c.1920. I believe that my grandfather, Fred Hitching, was responsible for building both of the archways here, and it is known the Fred Rickett – another Pulham Rock Builder, noted in Chapter 44 – also worked here. When Walter Melville Wills died in 1941, his son, Captain Douglas Melville Wills, inherited the estate, and donated it to the University of Bristol ‘for the furtherance of agriculture’. It served as the University’s Botanic Garden for more than fifty years, but they moved to another site shortly after my visits to Bracken Hill in 2000-01. However, the gardens are listed and still in good order, and the house has been converted into flats. Diane Stewart reports that Walter Melville Wills’ lovely house at Bracken Hill has now been divided into two large flats, one of which has been sold. Part of the agreement to sell the site by the University of Bristol – the previous owners – was that it has to be open to the public twice a year, so visitors will be able to visit and view the lovely examples of the Pulhams’ work that they contain. A full description of the work done by James Pulham and Son at Bracken Hill – together with a number of pictures – can be found in Chapter 39 of Rock Landscapes: The Pulham Legacy – the critically-acclaimed and lavishly illustrated definitive story of the lives and work of James Pulham and Son. Written by Claude Hitching, with featured photography by Jenny Lilly. Published by Garden Art Press. Posted on October 8, 2014 December 6, 2016 by Claude HitchingPosted in Book ContentsTagged . . James Pulham and Son, Brack Hill, Captain Douglas Melville Wills, Claude Hitching, Pulhamite arches, rock garden, Rock Landscapes: The Pulham Legacy, Walter Melville Wills, water garden.